Front Row: Julie Heverin, Kathleen McNally, Kathleen O'Boyle, Enda Kenny, T.D., Ann McLoughlin, Vivienne Egan, Maureen McEllin. Middle Row: Kathleen Hussey, Myra Gavin, Mary Hoban, Patricia Barnicle, Brid Flynn, Nancy McEvilly, RIP., Helen McNally. Back Row: Kathleen McHale, Teresa Carr, Carmel Gallagher & Kathleen Finnegan. Photo Tom Campbell. Enda Kenny T.D. Photograph from my 1975 Files. 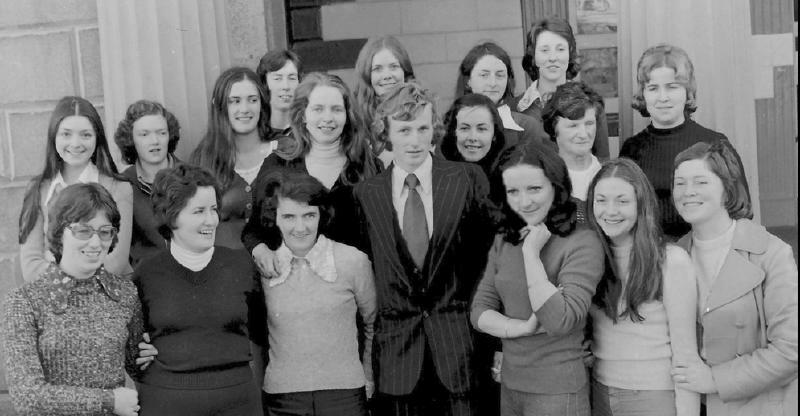 Julie Freine, Kathleen Stewart, Kathleen Nestor, An Taoiseach, Enda Kenny, Ann Melvin, Vivienne Armstrong, Maureen McEllin. Middle Row: Kathleen Hussey, Myra Berry, Mary McGloin, Patricia Barnicle, Brid de Barra, Helen O’Brien. Back Row; Kathleen McHale, Teresa Gavin, Carmel Gallagher & Kathleen Casserly. Photo Tom Campbell Photograph of An Taoiseach Enda Kennywith same group Taken on 3rd April 2011 36 Years later.